Following the election of President Donald Trump, a new form of rhetoric has made its way onto the political stage. “America First” was a frequent chime heard both in President Trump’s presidential campaign as well as during his time in office. A critic of globalization, President Trump has vowed to “Make America Great Again” and “win” in trade agreements abroad. Trade has been an integral component of President Trump’s time in office as he has removed the United States of America from agreements such as the Trans-Pacific Partnership (TPP) and vowed to alter the agreement if not completely remove the United States from the North American Free Trade Agreement (NAFTA.) President Trump has remarked that the trade agreements the United States belongs to have hurt American citizens at the expense of fostering development abroad. At the Bucknell Institute of Public Policy, we were interested in observing what American citizens believe should be an important factor when considering trade agreements. Are Americans seemingly following President Trump’s lead and putting America first or are there other factors that Americans are placing greater weight on? 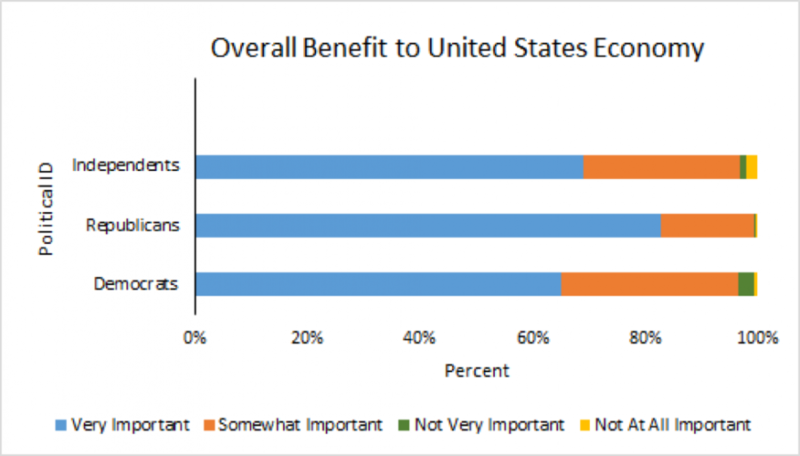 For the first comparison report, we asked respondents to rate how important the overall benefit to the United States economy should be considered when entering a trade agreement. Respondents could rank their responses from Very Important to Not at All Important. For the purposes of our study, we broke respondents down based on their political identification. We found that 65% of Democrats, 82% of Republicans, and 68% of Independents believe the overall benefit to the United States economy is very important when considering entering into a trade agreement. Next, we observed that 31% of Democrats, 16% of Republicans, and 27% of Independents believe the overall benefit to the United States economy is somewhat important when considering entering into a trade agreement. On the other side of the spectrum, we found that 2% of Democrats, 0% of Republicans, and 1% of Independents believe the overall benefit to the United States economy is not very important when considering entering into a trade agreement. Finally, we observed that 0% of Democrats, 0% of Republicans, and 2% of Independents believe the overall benefit to the United States economy is not at all important when considering entering into a trade agreement. We then posed the question how important should the overall wages paid to workers be considered when entering a trade agreement. Respondents could rank their responses from Very Important to Not at All Important. For the purposes of our study, we broke respondents down based on their political identification. We found that 50% of Democrats, 37% of Republicans, and 38% of Independents believe the overall wages paid to workers is very important when considering entering into a trade agreement. 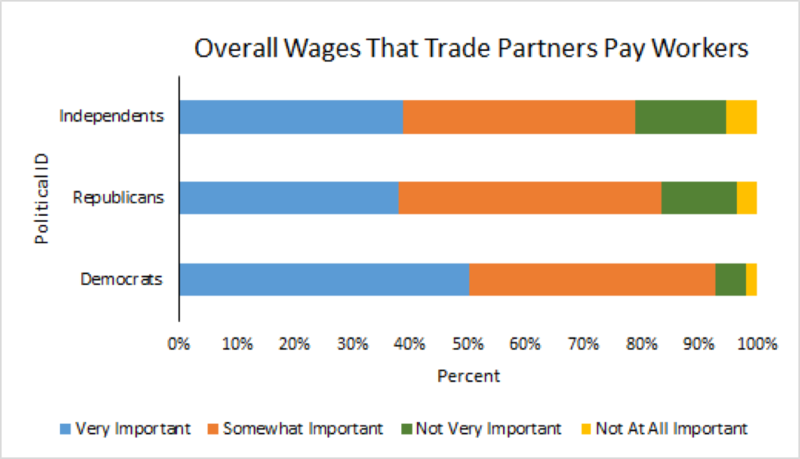 Next, we observed that 42% of Democrats, 45% of Republicans, and 40% of Independents believe the overall wages paid to workers is somewhat important when considering entering into a trade agreement. On the other side of the spectrum, we found that 5% of Democrats, 12% of Republicans, and 15% of Independents believe the overall wages paid to workers is not very important when considering entering into a trade agreement. Finally, we observed that 1% of Democrats, 3% of Republicans, and 5% of Independents believe the overall wages paid to workers is not at all important when considering entering into a trade agreement. It is interesting to see how party affiliation affects which factors we allot the most importance to when considering entering trade agreements. Could the decrease from the number of respondents who answered “very important” for overall benefit to the United States economy to the number of respondents who answered “very important” for overall wages paid to workers be attributed to President Trump’s agenda of “America First?” Perhaps we are beginning to see a turn towards more isolationist ideals than the globalist ideals shared in previous presidencies. year sample with selection within strata by weighted sampling with replacements (using the person weights on the public use file). The matched cases were weighted to the sampling frame using propensity scores. The matched cases and the frame were combined and a logistic regression was estimated for inclusion in the frame. The propensity score function included age, gender, race/ethnicity, years of education, and region. The propensity scores were grouped into deciles of the estimated propensity score in the frame and post stratified according to these deciles. gender, age (4-categories), race (4-categories), and education (4-categories), to produce the final weight.